A new centre of gravity on the Tsim Sha Tsui waterfront, Rosewood Hong Kong celebrates a culture in which Rosewood Associates are inspired to look at life a little differently, through a lens of limitless possibilities. We aim to create an innovative culture of intimate and casual, yet refined, hospitality, empowering Rosewood Associates to create indelible memories for themselves, for one other and for our guests. 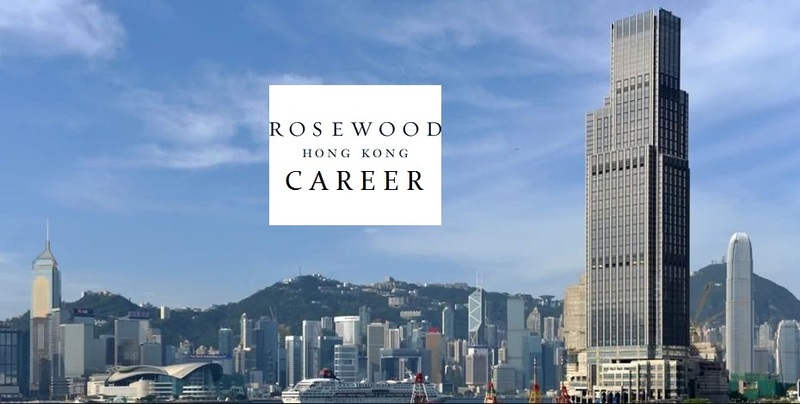 The vertical estate on the majestic harbour, Rosewood Hong Kong is seeking intuitive, engaging and impassioned Associates to embark on a Rosewood Journey with us. 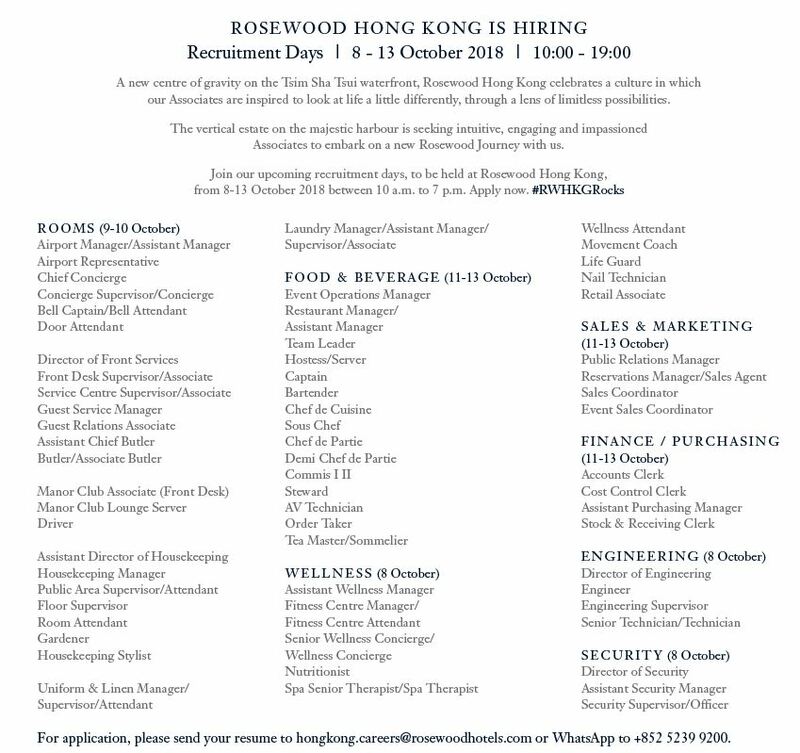 Join our upcoming recruitment days, to be held at Rosewood Hong Kong, from 8-13 October, 2018. In Winter 2018, Rosewood Hong Kong will become the newest global property for Rosewood Hotels & Resorts® worldwide, as a culmination of the group’s focus on innovation, progressiveness and a differentiated approach to luxury hospitality that is at the core of the Rosewood Hotels’ strategy. The vertical private estate on the majestic harbour, Rosewood Hong Kong establishes a new paradigm in luxury hospitality and is at the epicentre of the Victoria Dockside arts and cultural district. Victoria Dockside signals the unprecedented development of the Tsim Sha Tsui waterfront in a world-class and transformative planning, design, engineering and architectural project by the award-winning architects Kohn Pedersen Fox Associates, who were pivotal to the development of evolutionary New York neighbourhood Hudson Yards and James Corner Field Operations who led the transformation of the High Line. Impeccably considered, refined interior concepts by New York-based hospitality design guru Tony Chi of tonychi associates have been designed to create an intimate, exclusive guest experience that is maintained throughout. Transitioning from the bustling streets outside to the enveloping interiors, the guest journey has been designed to emulate the entry into the private chambers of a refined residence, with 323 rooms, 90 suites including 18 specialty suites with sky gardens, private pools and wellness facilities, and 186 residences, which are situated on the higher floors of the building, to create a dialogue with Victoria Harbour that celebrates Rosewood’s integral connectedness to the water. Fundamental to the design of Rosewood Hong Kong has been the incorporation of green spaces and outdoor areas to reflect the vision for the vertical estate, which is utterly residential in look and feel. F&B: Rosewood Hong Kong’s numerous bars and restaurants will create a vibrant new gastronomic hub in Kowloon, showcasing a series of unique concepts which reflect the best of the city’s eclectic, globally-renowned dining scene and Rosewood’s signature, innovative approach to intimate, casual and lively dining. Weddings and Events: Substantial event facilities feature soaring windows, a lawn and private planted terraces with harbour views and state-of-the-art technology, in Rosewood’s noteworthy, high-residential style. Expansive meetings and event space is enhanced by artfully landscaped gardens with immersive harbour views, showcasing Rosewood Hong Kong’s significant event capabilities. Asaya: Rosewood Hong Kong will be the first urban outpost of Asaya, Rosewood Hotels and Resorts® innovative, integrative wellness concept. Integrative wellness is key to the essence of Asaya, which means setting an intention to propel self-change and transformation for the mind, body and inner self.